Located in South Australia, this mine site had aggressive waste-water needing to be contained. For this application, a leakage of the lining system can cause damage and ultimately cause failure of the storage. • a compacted clay layer as the secondary liner to provide even further protection. The cross-section above above shows the lining system. 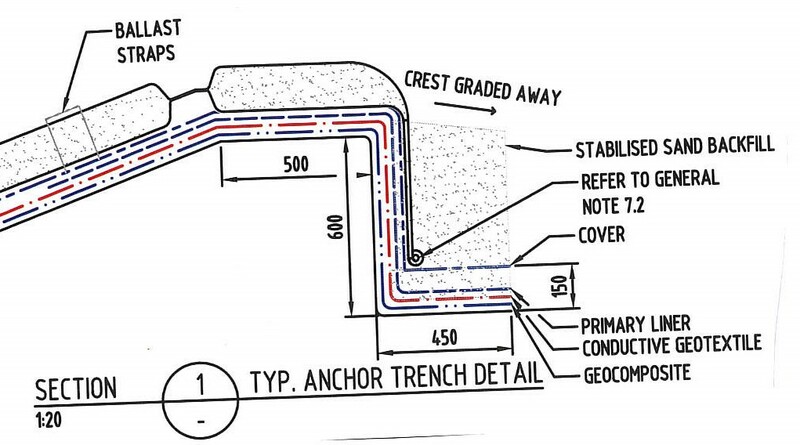 While the primary liner leakage rate was designed to allow for best practice seepage rates with an additional factor of safety, the target commissioning seepage rate was close to zero. In order to achieve the target seepage rates, a high sensitivity electrical liner integrity survey was to be performed. 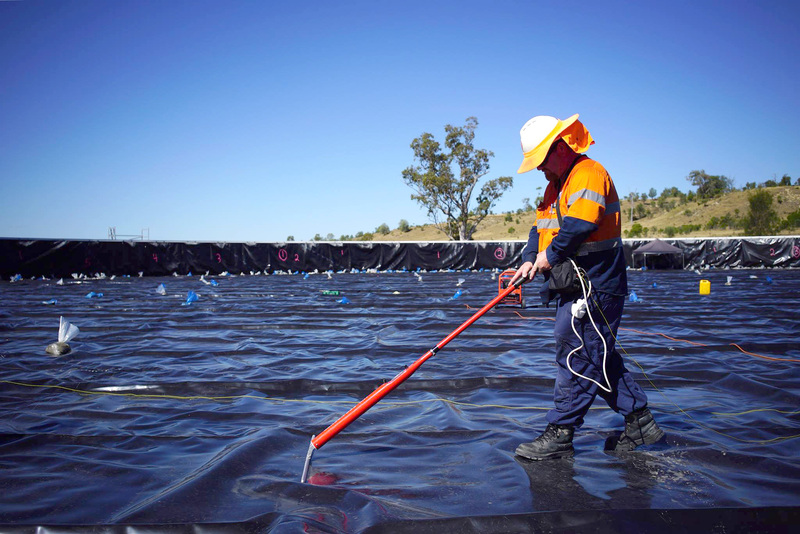 As the primary liner is not available with a conductive layer to ensure an accurate survey, a conductive material was required below the CSPE primary liner membrane layer. Geofabrics was selected to provide the geotextile between the geonet and the CSPE liner (primary liner) to provide a cushion and filter layer. The bidim A34 geotextile was made highly conductive so that the installer could perform a leak detection survey on their installed liner. This was the first bidim A34C project undertaken. Geofabrics also supplied the geocomposite drain (or geonet) material to provide the drainage layer between the primary and secondary lining layers. The design and construction works were completed at the mine site in South Australia by Fabtech. The CSPE geomembrane materials were pre-fabricated to shop drawings for precision installation on site. The constructed result was a high-quality storage asset with an assured commissioning process, avoiding risk or delays when handing the asset over to the operational department at the mine. Graham Fairhead, Managing Director, Fabtech PTY LTD.